Here follows a series of six pictures featuring the annual Amateur Athletic Sports Day at Handcross held in the Red Lion meadow behind the pub. Part of the field was used later for the housing estate of Truggers which was constructed soon after the Second World War. The picture shows a presention which took place at the end of the day’s events. 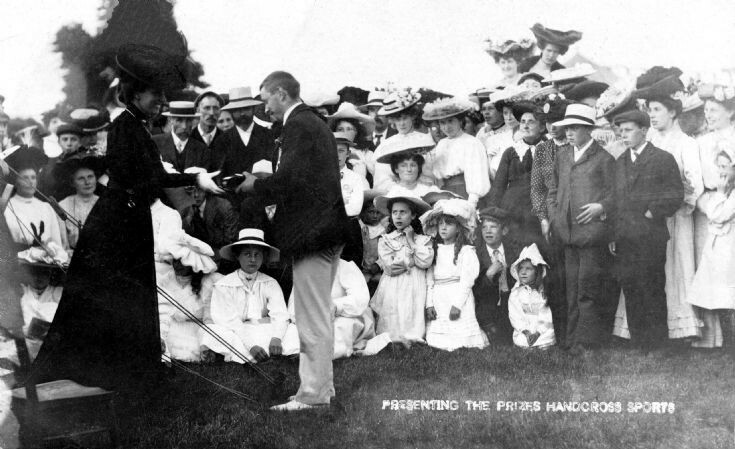 There are no details supplied with the picture so even the lady conducting the presentation is anonymous. The Large Version shows a close up. It seems to be a very serious event, but at least the fashions liven up the scene!